The Very Hungry Caterpillar & Friends Stickerbook is a simple, yet entertaining app that allows children to explore their imaginations by decorating a variety of scenes with wonderful illustrations found in The Very Hungry Caterpillar by Eric Carle. This app has many of the same high quality, delightful illustrations and characters that are in the book The Very Hungry Caterpillar. The music is a quiet and simple melody that compliments the app perfectly. Also Included are a wide variety of stickers such as, spiders, butterflies, caterpillars etc. that can be added to the scenes easily by dragging and dropping them into place. This app is set up for creative play for children and does not include any educational components. With that said, parents may choose to create an educational opportunity by working on naming the various stickers as children play. 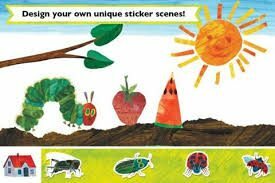 The Very Hungry Caterpillar & Friends Stickerbook is all about having fun while creating vibrant and exciting scenes with a wide variety of stickers. Children will have a blast as they explore the 5 scenes while adding various stickers. They may even decide to create their own stories aloud as they play. This is a great app for kids that love Eric Carle books and love using their imaginations. When you consider what you might pay for a book by Eric Carle, this app is priced very well. For just under two dollars you get 5 scenes for sticker play along with a wide variety of stickers. I think parents will find this app to be both fun and affordable. With the simple to use interface this app is great for little ones. Not only can they easily drag and drop stickers to the scenes provided, they can also re-size the images to fit perfectly by pinching or stretching the sticker. Parents will also be glad to know there are no social media links or flashy advertisements to distract children as they play. There is an option to view other apps by the same developer, but it is set up in a way that parents have to swipe the screen in a very specific way to gain access. Parents will also want to be aware of the email feature that allows children to share their sticker creations by emailing a copy from the device they are using.